Three guesthouses provide simple rooms with approximately fifty beds. Dormitories have bunk beds, accommodating up to six people per room. Semi-private rooms have two beds. Bathrooms are shared. Camping is available in season; please bring your own tent and bedding or small vehicle. No camping November through March. Call our office at 845.782.5575 for more information. *Note: Be aware that there may be deer ticks as well as poison ivy in certain parts of the outdoors, especially in the spring and summer. We can advise you how to protect yourself. Please click here for important information. We serve lacto-vegetarian and/or vegan meals three times daily in a variety of cuisines, incorporating fresh and natural foods wherever possible. 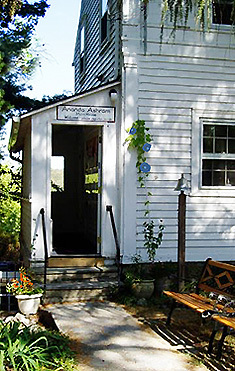 In season, much of the produce may be supplied by the Ashram's garden. Water comes directly from our spring-fed wells. Note: During the winter months, weekday breakfasts may be available only informally. For day visitors: lunch or dinner $10, breakfast $5. Bring comfortable clothing for meditation and yoga or other exercise, warm clothing and firm shoes for outdoors, flashlight, alarm clock, toiletries, notebook and a mat or blanket for outdoor use. Also bring an extra towel if you require more than one per week. We do supply yoga mats and yoga props for use in our classes. 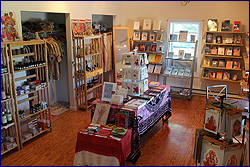 Our Gift Shop and Bookstore carries works by Ashram Founder Shri Brahmananda Sarasvati in print and recorded media as well as a good selection of other books on Yoga-Vedanta and related topics. The audio section has CDs by many of the artists that have performed at the Ashram. We offer a wide variety of products and gift items including Ayurvedic products, essential oils, devotional items such as statues, mālās (prayer/mantra beads), meditation shawls, incense, candles and more. Plus there is a "Sweet Treats" and vegan snack section. Hours: Weekdays 1:30-5:30pm; Sat-Sun 10:30am-12:30pm & 1:30-5:00pm. Also opened by appointment at other times. Offering Ayurvedic facials and massage, Swedish massage, shiatsu, acupressure, aromatherapy, and Raindrop Technique. Eucalyptus sauna is available with massage. Open by appointment for members 10:30am to 7:30pm daily. Call 845-783-6203. 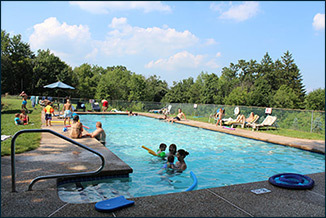 The swimming pool is open daily from Memorial Day weekend until Labor Day, weather permitting. 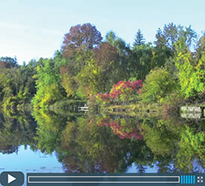 It is available for overnight guests and members of the Yoga Society of New York. Proper swim attire is required. Swimming is at your own risk.